East Nasty | East Nashville. Running. Community. It’s a great night for a run run! Highlights for this week: cup washing, the raffle, and the half and full marathon post race party. You can READ HERE for more details on how our Wednesday night runs work. If you are a run/walker and/or want to get a head start, meet at 5:30pm and join our Lasty Nasty Group. You can sign up here. We will also do the cup cleaning raffle from last quarter tonight. Everyone who washed the cups last quarter is entered for a chance to win a $100 gift card to NRC courtesy of Rachel Schaffer and Schaffer Law Firm . There are still spots open to wash the cups for this quarter. Our post marathon party will be April 27th at 6pm at the Pavilion East. This party is for anyone who ran the race, cheered at the race, runs with East Nasty, has thought about running with East Nasty or knows someone who runs with East Nasty. RSVP for the event here. We’re stoked about our sponsors for this year! Edley’s BBQ will have snacks (available until we run out). 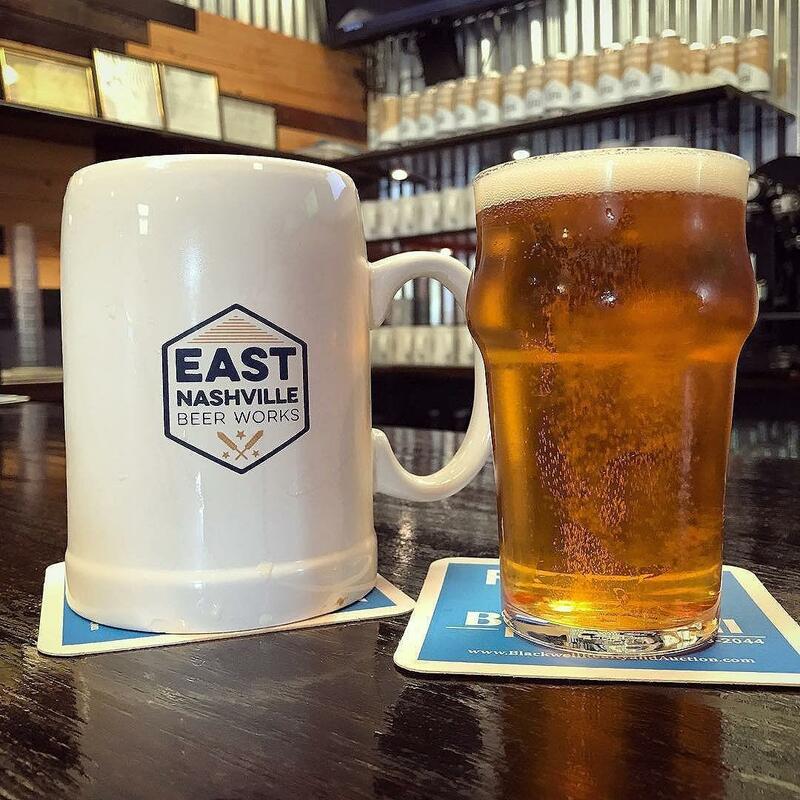 East Nashville Beer Works will be on tap, so bring an ID and cash to tip the bartenders. Thanks Edley’s and ENBW! East Nasty is a non-profit organization and everything we do, including the free half and full marathon training groups, is done by volunteers. So, we are suggesting a $10 donation at the door. Please consider donating so that we can continue to do awesome running stuff! *Bonus point if you read this all the way through. **Double bonus if you caught the Anchorman reference in the title and read this in Ron Burgundy voice. 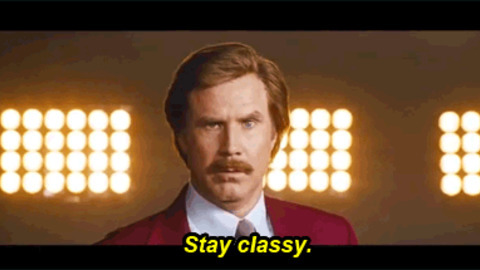 You stay classy, East Nasty. It’s a great day to run! Highlights for this week: cup cleaning raffle, race shirt pick-up, training group location change and Doggie Dash discount! Tonight’s route is ‘Round the Bird. Please share the greenway with playground goers and the farmers market crowd. We’ll be at the Yellow House at 11th & Holly and get started at 6pm. The cup cleaning raffle is tonight! Everyone who washed the cups last quarter is entered for a chance to win a $100 gift card to NRC courtesy of Rachel Schaffer and Schaffer Law Firm . We still need a few volunteers to sign up to wash the cups for this quarter. Look at these amazing East Nasties rocking their new race shirts! If you haven’t picked yours up yet, they will be at the Yellow House starting at 5:30. Please get them ASAP! Thanks to Juanita and Kevin for coordinating the shirt pickup. You all are awesome! Location change: the training groups will meet at 11th & Holly on Saturday morning due to a conflict at Nissan Stadium. Check your email and social media for updates. This week is Route #11 – The Church Run. East Nashville is one of the oldest communities in Nashville with many historic buildings dating back to the late 1800’s and early 1900’s. Some of the most beautiful architecture is highlighted in the churches – and we pass around 15 of them on this route. It’s a great week to invite new runners and beginners – because you can easily stop after just 2 miles of the first loop of the figure 8. We meet at the corner of 11th & Holly at 6pm. We run every Wednesday – rain or shine, hot or cold. If you are a run/walker and want to get a head start, meet at 5:45pm and join our Lasty Nasty Group. You can READ HERE for more details on how our Wednesday night runs work. Remember we share the roads with walkers, cyclists, and cars – please, stay on the sidewalks or to the far left on the road, obey traffic signals and stop signs, and cross only in marked crosswalks. Help us be good neighbors to the community! After the run, head to Nashville Running Company where an ambassador from Ragnar will be there promoting the Kentuckiana Trail Race from 6pm-8pm! There will be pizza and beer (first-come, first-served) , and a sweet discount code (KY19NASHRUN) so make sure you stop by and say hi! Times, they are a changing…..
We are currently working on a new look and new website launch for our sweet running club! We hope the new website will be more functional and easier to navigate for our current and new runners. It will mean some changes in notifications (less emails, more website and social media), but it will also be easier to find events and different runs/programs happening in East Nasty. Stay tuned……. Wednesday, March 13th- It’s Electric! Tonight is Route #10: Electric Slide. This route is awesome with one of the w̶o̶r̶s̶t̶ greatest hills in East Nashville (I’m lookin’ at you Lenore……) – but you need to be extra cautious at one particular intersection. Right before the three mile mark, you turn left onto 14th from Sevier. Before you turn left onto 14th from Sevier, you need to STOP, look for traffic, then cross the street and RUN ON THE SIDEWALK on the RIGHT SIDE of 14th. BE VERY CAREFUL CROSSING 14th! For those of you who know the area, make sure you alert those around you. Wednesday, March 6th – NRC Pint Night Baby! We’re going rouge tonight! (We’ll be back to our regularly scheduled program and route #10 next week) This Wednesday is one of our most popular runs: Route #5: Walking Bridge. It’s always fun to run across the bridge and through downtown. As we run through downtown, remember that you are representing our organization and that our club’s safety, reputation, and standing in the community is a responsibility you share in. That means crossing the street only in crosswalks and intersections – never in the middle of the road. That means stopping at stoplights and to slow down and use caution at intersections. We need you to be respectful and courteous to pedestrians on the sidewalks downtown, along with other runners, cyclists, and motorists that we share the road with. Thanks for doing your part! It’s Pint Night at Nashville Running Company after the run! If you don’t know where they are at, tonight’s route conveniently runs right past NRC – or maybe just to it. No judgement 🙂. NRC always offers a 10% discount to East Nasty runners. Have a pint of some Yazoo and pick up some new gear while you’re there! Also, Google Fiber, Top Golf, and Results Physiotherapy will be there! You don’t want to miss it! If you’re not planning on running the Rock n’Roll Nashville race this year, or have family & friends looking for a place to support on the course, join the official East Nasty cheer station! Best station wins $$ for the club, and is a great time too! The cheer station will be located on 11th Ave, under Demonbreun bridge, just out of the Gulch. More details to come.